Circus workshops are ideal for schools, guide and scout groups and even for keeping the little ones entertained at weddings (Although the adults normally end up getting just as involved aswell!). Suitable age ranges are from 3 upwards, even small children can try plate spinning, mini stilts and basic juggling skills. Sessions can last from one hour up to a whole school day. 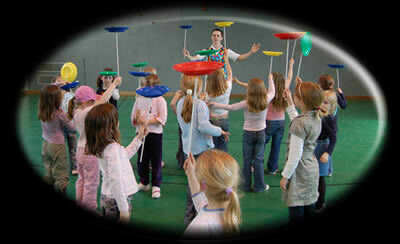 For schools the workshop is presented in a structured manner, Teaching the children plate spinning, feather balancing, juggling, diabolos and many other circus skills. A circus day includes a fun show at the start of the day and then the children are taught in their seperate class groups. 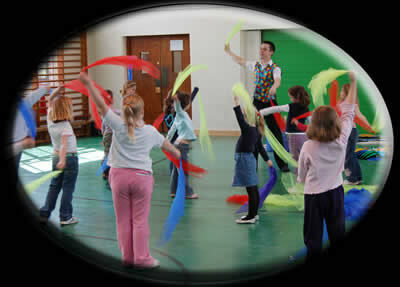 Steve has provided circus skills workshops to schools all around the country and has a full CRB certificate and insurance. All equipment is provided, please email for prices as it is dependent on travelling distance.